Jacob Leski during his glory days. I decided to interview Jacob Leski for this article. 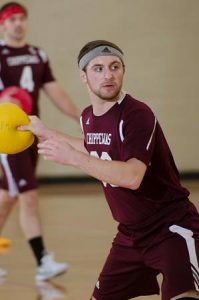 He is the former President of Central Michigan’s Dodgeball Club and current Director of League Expansion and Retention for the NCDA. He is well known in the league for his loud play and great catching ability, but off the court he is a great guy and genuinely loves the league and the sport of dodgeball, and works very hard to see it flourish. Colby: First off, what was your first dodgeball experience? Jacob: Well, I was maybe on CMU’s team for less than 2 weeks before I was starting at MDC. It was a nightmare. I had no idea what was going on and we got annihilated. I’m just happy I stuck with it. Then I got to be a part of the infamous 10 man roster we brought to Nationals in 2013. Those days were brutal. C: That sounds like a great story, can you elaborate more on the Nationals 2013, 10 man team? J: It was a team full of misfits. No one took us seriously and for good reason. I like to think that terrible season is what finally sparked CMU to start taking ourselves seriously and truly compete. That team was composed of some big names, Wes Peters, Brett Hadwin and Mike Riley to name a few. It was a very humbling experience for all of us, even those of us that were brand new and knew of Centrals legacy. Glad those days are behind us…hopefully. Wouldn’t wish that dysfunction on any team. C: So you’d say that the poor season helped you become the player you are today? J: Without question. Taught me to play with a chip on my shoulder…pun intended. C: Great, I love it. What do you think was the main contribution that you made to both Central, and the league during your playing career? J: Great question. I would say that hard work and dedication pay off. I gave my all to see CMU return to former glory. I was so sick and tired of no one taking us seriously and always being taken as a joke in the state of Michigan. We were always called a “Dark Horse” and that always ticked me off. I wanted us to be the favorites to win it all. I essentially made it my mission to make our club feel like a fraternity or pseudo family. I strongly believe that I achieved that goal in my time at CMU. Plus I hate losing more than most things so winning games again felt pretty damn good. If we were able to go from two first round exits to two straight National Championship appearances I find it hard to believe that other clubs cannot achieve the same feat. So yeah, I believe I helped give leaders of other clubs hope that their hard work and dedication is not all for nothing. Just have to keep pushing to be the absolute best your team can be and play as many games as you can. Keep that hunger alive to be the best. I also like to believe that I taught the rest of the league to never forget to have fun on the court. Too many guys I have gone against forget that. I was an absolute lunatic at times on the court, some found it entertaining, others wanted to slap me in the face when shaking hands, but that never bothered me because I was making some of my favorite memories that I will cherish. Win, but don’t forget that we all play this sport because it is a blast to play. A big shoutout to my former teammates and all of the Michigan teams for having to constantly deal with my shenanigans year in and year out and letting me be me. C: That’s a great answer, one last dodgeball question, how have you taken your love of the game and playing, to becoming the Director of League Expansion and Retention? J: Another good question. When you are done playing in the NCDA, I know at least for me, it is a tough transition. Specifically going from playing to having to watch. However, the 4 years I spent playing are some of my favorite memories that I have. I want others to have that same opportunity. I love this league and want to be able to see it still growing 25 years from now. Up until this year, the league has been stuck at 21-23 teams. It has fluctuated for many years. We are at a critical point where we need to keep adding teams or we won’t last much longer. Thankfully we are gaining interest from a lot of teams from all over the country. I hope that 10 years from now playing on a college dodgeball team isn’t something that blows people away, I want it to be something that your Average Joe (no pun intended) knows about. I’ve essentially focused the passion I had for making CMU a dynasty towards trying to lay the foundation for this league to last for many many years. C: That’s awesome, man. A few more questions, these ones are a little more about you as a person. What is your favorite movie? J: I have five: Forrest Gump, Saving Private Ryan, Dazed and Confused, Everybody Wants Some and Caddyshack. C: All solid flicks. Okay, last question, besides being on the executive board for the league, how do you spend your time? J: I’m a special education teacher in Chesterton, Indiana, a suburb of Chicago (No it’s not Gary). I’m also a middle school basketball coach. I live right by the Indiana sand dunes so I enjoy hiking them from time to time as well. C: That’s great. Thank you so much for your time, always a pleasure. I learned three things from this interview; one, Leski will indeed use a pun if the opportunity presents itself, two, everyone loves Tom Hanks, and three, for all of you struggling teams out there, don’t give up or get discouraged. Even CMU struggled at one time. Put in the work, play as many matches as you can, and #TrustTheProcess. Thank you, Jake for your time. 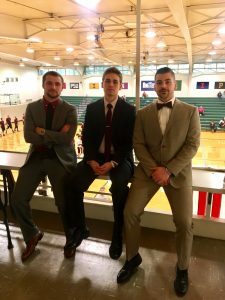 Jacob Leski, (pictured on the left), with Kevin Bailey, (Middle and GVSU Alumni and current Chief of Content), and Brett Hadwin, (Obviously on the right, CMU Alumni, NCDA content team member, and buff guy).